An American Jewish family, established in Baltimore, Md., by Jonas Friedenwald. His children were Bernard Stern, stepson (1820-73); Betzy Wiesenfeld (1820-94); Joseph (1826-); Isaac (1830-), who established a well-known printing press in Baltimore; Moses (1838-89); and Aaron Friedenwald (1836-1902). 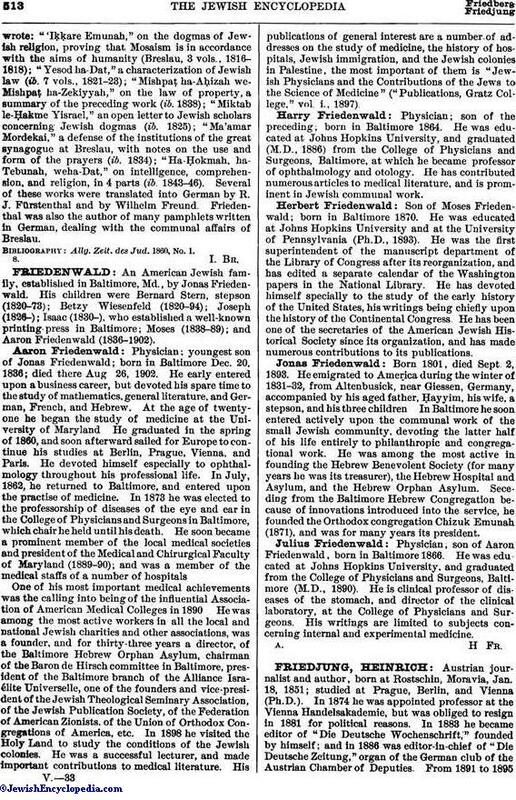 Physician; youngest son of Jonas Friedenwald; born in Baltimore Dec. 20, 1836; died there Aug 26, 1902. He early entered upon a business career, but devoted his spare time to the study of mathematics, general literature, and German, French, and Hebrew. At the age of twenty-one he began the study of medicine at the University of Maryland. He graduated in the spring of 1860, and soon afterward sailed for Europe to continue his studies at Berlin, Prague, Vienna, and Paris. He devoted himself especially to ophthalmology throughout his professional life. In July, 1862, he returned to Baltimore, and entered upon the practise of medicine. In 1873 he was elected to the professorship of diseases of the eye and ear in the College of Physicians and Surgeons in Baltimore, which chair he held until his death. He soon became a prominent member of the local medical societies and president of the Medical and Chirurgical Faculty of Maryland (1889-90); and was a member of the medical staffs of a number of hospitals. One of his most important medical achievements was the calling into being of the influential Association of American Medical Colleges in 1890. He was among the most active workers in all the local and national Jewish charities and other associations, was a founder, and for thirty-three years a director, of the Baltimore Hebrew Orphan Asylum, chairman of the Baron de Hirsch committee in Baltimore, president of the Baltimore branch of the Alliance Israélite Universelle, one of the founders and vice-president of the Jewish Theological Seminary Association, of the Jewish Publication Society, of the Federation of American Zionists, of the Union of Orthodox Congregations of America, etc. In 1898 he visited the Holy Land to study the conditions of the Jewish colonies. He was a successful lecturer, and made important contributions to medical literature. His publications of general interest are a number of addresses on the study of medicine, the history of hospitals, Jewish immigration, and the Jewish colonies in Palestine, the most important of them is "Jewish Physicians and the Contributions of the Jews to the Science of Medicine" ("Publications, Gratz College," vol. i., 1897). Physician; son of the preceding, born in Baltimore 1864. He was educated at Johns Hopkins University, and graduated (M.D., 1886) from the College of Physicians and Surgeons, Baltimore, at which he became professor of ophthalmology and otology. He has contributed numerous articles to medical literature, and is prominent in Jewish communal work. Son of Moses Friedenwald; born in Baltimore 1870. He was educated at Johns Hopkins University and at the University of Pennsylvania (Ph.D., 1893). He was the first superintendent of the manuscript department of the Library of Congress after its reorganization, and has edited a separate calendar of the Washington papers in the National Library. He has devoted himself specially to the study of the early history of the United States, his writings being chiefly upon the history of the Continental Congress. He has been one of the secretaries of the American Jewish Historical Society since its organization, and has made numerous contributions to its publications. Born 1801, died Sept. 2, 1893. He emigrated to America during the winter of 1831-32, from Altenbusick, near Giessen, Germany, accompanied by his aged father, Ḥayyim, his wife, a stepson, and his three children In Baltimore he soon entered actively upon the communal work of the small Jewish community, devoting the latter half of his life entirely to philanthropic and congregational work. He was among the most active in founding the Hebrew Benevolent Society (for many years he was its treasurer), the Hebrew Hospital and Asylum, and the Hebrew Orphan Asylum. Seceding from the Baltimore Hebrew Congregation because of innovations introduced into the service, he founded the Orthodox congregation Chizuk Emunah (1871), and was for many years its president. Physician, son of Aaron Friedenwald, born in Baltimore 1866. He was educated at Johns Hopkins University, and graduated from the College of Physicians and Surgeons, Baltimore (M.D., 1890). He is clinical professor of diseases of the stomach, and director of the clinical laboratory, at the College of Physicians and Surgeons. His writings are limited to subjects concerning internal and experimental medicine.